SULLY ERNA--founder, vocalist, guitarist and songwriter for the multi-platinum rock band GODSMACK--will release a new solo album Hometown Life on Friday, September 30 via BMG. Composed by SULLY on piano and acoustic guitar and produced in his New Hampshire studio, Hometown Life offers a departure from the tribal, world music feel and experimentation on 2010's Avalon; the new album's 10 songs are more accessible, sonically and musically precise. Listen to the new song and title track "Hometown Life" below. "When I do a solo album, I write for myself," says SULLY. "It's not for critics, radio or even fans. I like to explore different kinds of music that work together. A good song is a good song. I stopped categorizing a long time ago." A personal, confessional, raw work which takes yet another stylistic left-hand turn from the music he has created as front man for the multi-platinum rock band GODSMACK, "Hometown Life" offers a wide-ranging glimpse of Erna's eclectic musical tastes--from the singer-songwriter Billy Joel/Bruce Springsteen narratives of the title track and the bossanova touch of "Take All Of Me", to the breezy island feel of "Your Own Drum", the finger-snapping Motown bass lines of the bluesy "Turn It Up", the country flavors of "Different Kind Of Tears" and the wide-screen canvas of mini-symphonies "Blue Skies" and "Forever My Infinity". All of them are tied together with Sully's unflinching view of the emotional roller-coaster of his life, drawing us into an intimate space. "Hometown Life" explores Sully's diverse musical touchstones from James Bay, new country favorites like Chris Stapleton and Brantley Gilbert to soul legends Ray Charles, Etta James and Amy Winehouse. For "Hometown Life", SULLY worked with the same musicians from Avalon with the exception of percussionist Niall Gregory. On two of the songs--"Different Kind Of Tears" and "Your Own Drum"--SULLY collaborated with Nashville-based tunesmith Zac Malloy, who has also written for Carrie Underwood, Tim McGraw, Jake Owen, SKILLET and DAUGHTRY. "It was cool to see the same exact players sound completely different on this album," SULLY says. "It just goes to show their musicianship and versatility. They can really pull off anything I ask of them." With SULLY on piano, acoustic guitar and the stray bongo, "Hometown Life" was also a family affair, with his 71-year-old father Salvatore--who helped nurture his son's own musical interest early on--playing trumpet on "Turn It Up". It's a song Erna describes as a tribute to the power of music, a blueprint for how a song "makes you get off your seat, tap your feet, feel the energy and let it pass through you." "It was a proud moment," says SULLY, who also channeled his great-uncle, a famed composer from Sicily, in several of the songs which feature symphonic strings, like "Blue Skies", "Forever My Infinity", "Father Of Time" and "Falling To Black". "Hometown Life" allows an inside glimpse at Sully's vulnerability on a personal level, and he attributes much of his honesty and inspiration for this album to the love of his life, Sarah. "We've definitely gone through some complicated times and fought for what we have. And I'm really grateful to have her in my life. We have a very special and unique kind of relationship that most people can only dream of having. And I wouldn't put that second to anything! These songs are about exposing my inner thoughts, laying myself bare, being honest and expressing genuine emotions... about dark times and positive ones." Some songs offer fatherly advice, like the percussion-heavy "Your Own Drum", an admonition to his teenage daughter to follow her own muse and not be afraid to be different, or trying to deal with life's hurried pace, as in the rhythmic tick-tock of "Father Of Time". On the soaring "Blue Skies", SULLY reaches out to his loved ones and asks them to acknowledge the man and father he has become from the immature boy he once was. As for how his solo career fits in with his "other band," Sully is circumspect. "GODSMACK is a very energetic, aggressive, powerhouse rock band. It's for those moments when you want to scream and stomp your feet. My solo stuff is a lot more vulnerable, the grown-up version of who I am and how I process. It's about finding acceptance for the things that don't go right in your life, being appreciative for all the memories, good or bad. Sometimes these experiences can be very painful, but I do get some beautiful songs out of it. I'm just happy to be blessed with a gift that enables me to channel this stuff and vent it through my music." 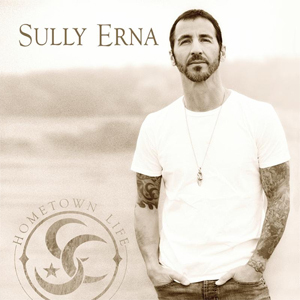 "Hometown Life" does just that, revealing sides of SULLY ERNA only hinted at in GODSMACK, "That's the whole point," he explains. "The people who have followed me and can appreciate it, I encourage them to explore. All my albums--including the ones with GODSMACK--are like musical journals, diaries of what I've gone through in my life at the time. I'd love to reach a whole new audience with this. Music has helped me get through some tough times. That's when I write, when something affects me emotionally, happy or sad." "For all those things we've ever done/Give us our chance to prove our love," sings SULLY on the album's closing track "Falling To Black". He describes it as "a beautifully sad song," which offers a glimpse of light at the end of the tunnel. The same could be said of "Hometown Life". As SULLY himself puts it in "Your Own Drum": "There's no shadows/If you don't have light."